Mactec Packaging Technologies specializes in unit dose packaging offering some of the most creative unit dose solutions in the market today. 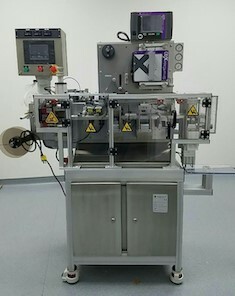 NANO 60, the small footprint Blister packaging machine is ideal for multiple setups or changeovers. While it’s primarily designed for small runs, the machine is robust and has the capability to withstand continuous production needs over a long period. The Nano 60 is designed & built in USA, fits cGMP standards and all your versatile packaging needs. Omega Design Corporation can offer qualified customers free registration to Pack Expo using our comp code: 21D42. Complete registration. If prompted, use Omega's comp code: 21D42. * Registration Requirements: Complimentary registration is valid for online pre-registration only; not valid on-site. Expires September 24, 2017. Complimentary registration is intended for use by end-user, retailer and contract packager registrants. Non-exhibiting suppliers and distributors are required to pay standard attendance fees. A non-exhibiting supplier is defined as anyone who sells packaging/processing/converting equipment and/or anyone whose primary product is packaging containers or materials, supplies, automation, or other services. A distributor is defined as a professional who resells packaging/processing/converting equipment/supplies.